In May 16 recycling was cheaper - it still is. As is the way in Barnet, nothing is ever quite as it seems. On 5 June, just four weeks after the local elections, Barnet Conservatives voted to scrap the separate brown bin food waste collections on the basis that it would save £300,000 a year. A minor concession was suggested by Cllr Peter Zinkin that officers should identify how those residents who wish to continue to recycle their food waste could do so but with the rider that it should be at no extra cost to the council. Both Mr M & Mr R thought this was a poor and illogical decision and decided to investigate further. “There are 12 front line blue bin and food collection rounds. Each of these round has one loader dedicated to collecting food waste, and two loaders to collect recycling. Stopping food collections will mean that 12 loaders will not be need for this purpose. The mid point cost of a loader including on costs for 2018/19 is £26,906. As such the savings on 12 loaders was calculated to be £322,870. The increase in disposal costs for food waste being transfer into the brown bin was £22,300. We are not going to make staff redundant those loaders who are no longer collecting food waste will instead be used as a pool of staff to fill in for staff on leave etc. rather than them being replaced by agency staff. This will reduce the recycling and waste agency spend”. The key figure here is the increased disposal cost of food waste incineration which is quoted as £22,300. Now one thing Barnet Council fail to grasp is that Barnet Bloggers double check everything. and a different picture emerged. According to many sources, food sent to anaerobic digestion has a much lower cost compared to being sent for incineration. NWLA confirmed what is termed “gate fees”, the charge for disposing of waste as follows: Waste sent for incineration £89.47 per tonne, food waste sent for anaerobic digestion £31.39 per tonne, a difference of £58.08 per tonne. Barnet currently sends 5,000 tonnes of food waste annually to anaerobic digestion, so the increased cost of sending food waste for incineration is not £22,300 but in fact £290,400. On that basis removing brown bin collections will not save £300,000 per annum, it will instead save £32,470. What is worse is that as the borough grows and more food waste is incinerated, that modest saving could be eroded to a point where there is no saving at all. So coming back to Cllr Zinkin’s offer, it is possible to recycle everyone’s food waste at a very modest cost compared to what officers are proposing, just £32,470 or around 23p per household per year. We think it’s worth it. "The London Environment Strategy and the policies and proposals on waste and recycling have been developed following an unprecedented process of evidence gathering, analysis, stakeholder consultation and dialogue. Barnet did not respond during the public consultation on the issue of food waste collection, which was included in the waste policies and proposals. The waste policies represent a trajectory that is the best environmental and economic solution for the city and at the borough level. Londoners too expect and deserve a consistency of service provision across the city. 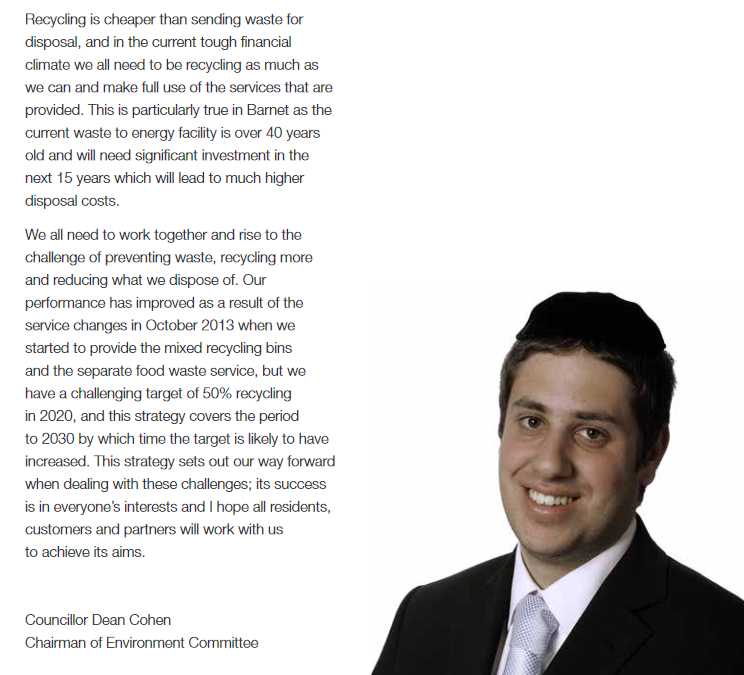 The evidence points to the impacts that food waste collection has on driving higher rates of recycling across the board I am concerned about the impact on recycling performance from Barnet’s decision to stop separate household food collections. I do possess, through the GLA Act, the backstop power to direct authorities, where I consider it necessary for the purposes of implementing the municipal waste provisions of the London Environment Strategy. Moreover, waste authorities have a duty under that Act to undertake their waste responsibilities in such a way as to be in general conformity with the strategy. However, the use of my power of direction is clearly an option of last resort, once all other avenues have been explored and exhausted. On the 19th of June, I wrote to the Leader of Barnet Council expressing my deep concern at their decision and requesting that it is put on hold. This will enable my officers to now start the process required of us under the GLA Act. See also answer to Mayor’s Question 2018/1583". Exit packages - why so many for so long?